Thump lovers rejoice, Chennai based Royal Enfield has launched an all new Electra with Twin Spark Unit Construction Engine (UCE). The engine has been borrowed from its sibling Thunderbird Twinspark. 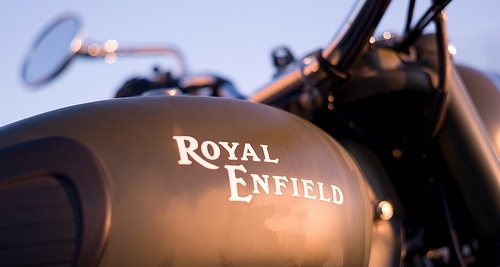 With a slew of launches in the past few months along with announcements of expansion plans, Royal Enfield has cleared the air that they want to take it headon. Similar to Thunderbird, Electra with two spark plugs produces 19.8 horses and a mammoth torque of 28Nm. Clearly, these are good signs that traditional bike makers like Royal Enfield are also concentrating on revolutionizing their bikes with better and latest technology. The UCE facilitates smoother operation, power delivery and cleaner emissions too according to the company. The bike has gas-filled shock absorbers that enable smooth riding over potholes and speed breakers. The bike can touch a top-speed of 120kmph and will give you a mileage of around 30-40 kmpl. But the mileage might vary depending on the condition of the bike and how you actually ride it. Well, RE bikers are very well aware of the fact that the Bullets aren’t for mileage. Coming to transmission part, the bike comes laoded with a Constant Mesh 5-speed. Upshifting/downshifting feels nice and smooth, and the power range spreads out very evenly. With much shorter gear ratio it feels a bit like a Japanese sports bike. Here comes the problem- Locating neutral is still a problem with this bike but according to a royal enfield mechanic there is nothing to worry and the problem will vanish automatically once the bike completes 1500-2000 kms on odo. There are two variants of the new Royal Enfield Electra Twinspark- the kick-start model (Electra Twinspark KS) and the auto or the electric-start (Electra Twinspark ES) version. And, the bike will be available in vibrant colors of Black, silver and red. As far as fuel efficiency is concerned, the new electra with uce engine scores over old electra with cast iron engine. 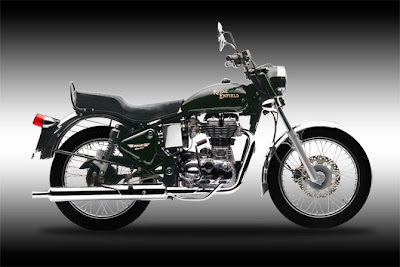 Royal Enfield Bullet bullet electra twinspark 350cc is supposed to give 40-45 kmpl of fuel economy. though official figures is somewhere around 51 kmpl (ARAI) but we got around 38 kmpl in city conditions and whopping 43 on our highway ride !! There are two different Electra TwinSpark models available – kickstart (KS) and electric start (ES). The bikes are available in three colors- red, silver and black. The Bike offered by Royal Enfield was a gorgeous Black with Chrome tints as you see. Ex-showroom prices of Delhi are Rs. 94,500 for KS and Rs. 98,500 for ES version accordingly. Ex-showroom prices of Chennai for the KS and ES versions are Rs. 89,846 and Rs. 93,846 respectively. now you don't have to anticipate your braking since the all new electra comes with hydraulic 280mm front disc set-up which are way better than the old drum brake. The Front suspension is hydraulically damped telescopic forks, stroke = 130mm. The rear suspension is swing arm with adjustable gas shock absorbers, stroke = 80mm. Suspension is good and provides comfortable ride until you need to ride on the rough terrain, then it becomes a little rough. But on the usual roads there are no problems with it though. Overall braking power on Electra TwinSpark is more than sufficient, and suspension is reliable and mild. The overall length, height and width of Royal Enfield Bullet electra are 2140, 1120 and 810mm respectively. The wheelbase(1370mm), saddle height (800mm) and ground clearance (140mm) are same in both the machines. The curb weight of electra twinspark is 180 kg for kick start version and it is 183 kg for electric start. No other bike can have as huge or lasting an impact on your life as the Bullet. The Bullet can transform your outlook towards life, no less! One stands taller, shoulders feel broader, chest swells up and arms feel infinitely stronger. You feel invincible, like nothing or no one can lay a finger on you. (This invariably causes most problems but while the feeling lasts, it's great). While riding her, your hectic cutthroat schedule somehow seems to lighten up. As you use her, you develop a telepathic bond with the bike, she becomes a part of your system like no other bike can ever hope to. The riding pleasure that the Bullet offers is unmatched bar none. Sure when you get to a stretch of bad tarmac, your backbones are in for a little rearrangement but out on the open road, a couple of 100km from your destination, the throb of the 350cc lump between your legs, the fantastic exhaust note making merry music at a steady 90kmph... that's what touring is all about. That's what the Bullet is all about. It is very comfortable for a long drive. i am very happy with this vehicle. all diehard fans of enfeild bullet will definetly remember the bullet. its gives imense pleasure while riding this bike,definately a class apart. @rohan wht happened dude? explain a bit.. Correction: "This gives the fuel-injected Electra the classic Bullet look..."
Electra Twinspark is NOT Fuel-Injected. Only RE Classic 350 & 500 are FI. @sid thanks for correction ..by the way classic 350 doesn't have efi !! My name is Raman and i am a working professional. I read a number of mixed reviews regarding this bike and was confused at one point of time. Not only reviews, but most of the people i took suggestion from also had some mixed kind of views regarding the bike. I was thinking to buy this bike for the last couple of years, even before the electra uce was launched. but every time i plan to buy the bike someone changed my mind and my program was delayed. I even testdrove the bike and even i feel that there a re a number of limitations in the bike, like the kind of vibration it has is annoying. Also i noticed one thing which i did not see in any of teh reviews. The black colour of the bike fades very soon (may be in a year or 2). So now i believe that if you want to own a RE, you have to have a passion for that. i agree it is a big investment for a bike, but trust me it is a asset for life. Finally i am going to book the bike today. I hope it will fulfill my expectations. Is there heavy crank of 500 for Standard 350 UCE model. Ganesh from Kerala write at cartreadindia and Dealer guy also told me. & what is Constant mesh 5 speed Gear box (specified only to Standard Model) Vinil, it will help us to finalise model. If you like any bull from heart, go for it, b’coz bulls are of different from rest of the bikis ! I have also booked by Electra UCE n waiting for it..
the feeling is so diffrent to ride this bull. i have also planed to bye this byk from last 6 month but i m confused subject of engine ferformance oil leackeg vibration and maintanance of byk compresion to old unit construction engine. more vibration less weigth more pickup and easy handle compare to old model. @bablu RE electra rather all enfields have a tendency to vibrate. But no worries it'll go off with the passage of time. The only drawback is the EFI which backfires sometimes and stalls.